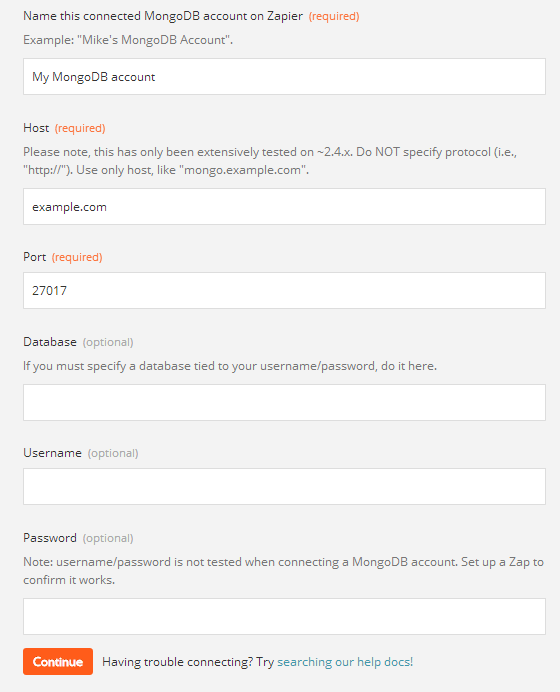 What MongoDB Triggers and Actions are Supported? New Field - Triggers when you add a new field to a collection. New Document - Triggers when you add a new document to a collection. New Collection - Triggers when you add a new collection. Create Document - Create a new document in a collection of your choice. Host The IP address or hostname (db.example.com) of where your database instance resides. Make sure it is accessible from outside your network. We send out database connections from the IP addresses listed below. Port 27071 is the default, change it if you're using a non-standard port. Password Similar to the username, make this a unique strong password (check out https://random.org). If your database is hosted within a VPC, it might not be assigned a public-facing IP address. On AWS, for example, you would need to assign an Elastic IP in a public-facing VPC subnet. Check the field you are using for the Order By Field. Although the help text suggests using the _id field, it's possible that the ID field in your database doesn't auto-increment or have the timestamp encoded into it. Sometimes Mongo randomly generates characters for the ID field, and if you order by that field, we'll sort the results in reverse alphabetical order. Once you have over 100 results, any new documents with an ID that starts with a letter in the beginning of the alphabet or with a number will be missed. To fix, make sure to use an Order By Field that is either a timestamp or an auto incremented number.